No geographic area is immune from the risk of hailstorms. Hail forms when raindrops hit very cold temperatures and freeze into balls of ice. Depending on the size, hail can be extremely damaging to people, animals, property and cars. And, if winds are strong enough, hail can fall with enough force to penetrate solid surfaces. Falling in paths known as hail swaths, hail storms can range in size from a few acres to an area 10 miles wide and 100 miles long. Some geographies are more susceptible to hailstorms because the elevations at which they form are much closer to the ground than for locations at or near sea level, where hail has time to melt before reaching the ground. This is historically the case in the high plains, but no area is immune from the risk of hailstorms. The first concern when preparing for a possible hail storm is life safety. After that, thoughts can turn to protecting physical property. 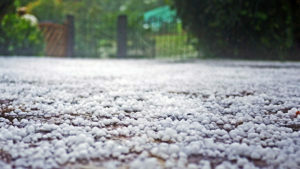 Much of the preparation for hail events resides in roofing systems, maintenance and upkeep. With that in mind, consider taking action to protect lives and reduce property damage. Stay indoors and make sure all window covers are intact in case of window breakage. Do not inspect property damage until the storm has passed. Hail damage may not be obvious so it’s important to examine all glass surfaces, building walls and the roof. Check HVAC equipment. Hail often damages condensing coils by denting the exchange fins. Consider storing your fleet vehicles in more than one location to spread risk and explore the possibility of protected coverings or indoor garaging. In terms of roof susceptibility and maintenance, the type and age of the roofing system, as well as its exposure to elements, play a role in how it performs against hail. Concrete or clay tiles perform better in hailstorms than asphalt or wood shingles. Built up roofs with denser substrates and multiple base sheets perform better than those using lighter substrates or organic felts. Coarse aggregate surfacing, such as ballast or gravel materials, increases the hail resistance of a roof. Regular inspection and maintenance of roofing systems will increase the life and resistance to hail and wind events. Hailstorms can be hazardous to any and all rooftop equipment – but none more than HVAC units, condensers and refrigeration units. Damage to these vulnerable systems can affect heating and cooling, cause water damage and result in loss of facility use. While eliminating exposure to your entire roof may be impractical, measures can be taken to minimize damage to rooftop mechanical features. Beyond hail guards, you may also consider installing protective screens over skylights. Again, it’s always best practice to regularly inspect your roof to correct defects and maintain its good condition. By taking steps to prepare your property for the possibility of a hailstorm and by making sure that you stay safely indoors during an event, you can protect lives and also decrease the financial risk to your property and business. This loss control information is advisory only. The author assumes no responsibility for management or control of loss control activities. Not all exposures are identified in this article. Contact your local, independent Bolder Insurance advisor for coverage advice and policy service. Coverages described here are in the most general terms and are subject to actual policy conditions and exclusions. For actual coverage wording, conditions and exclusions, refer to the policy or contact your Bolder Insurance Advisor.